This procedure covers reballing of BGA components. Refer to Circuit Technology Center specific component reballing instructions for machine operation, spacer construction and screen ordering. For plastic or tape (generally metal covered components) the process will be to add flux paste first then apply solder balls. Standard Reballing Flux is: EFD, FluxPlus 6-411-A Paste Flux. This may be changed upon customer specification. Standard Solder Paste is: EFD SolderPlus 63 RMA-A. This may be changed upon customer specification. Turn on the oven and preheat to 350 F (176 C). Allow approximately 20 - 30 minutes for temperature to settle between 338 to 356 F (170 to 180 C.) Ensure the FR4 baking platform (.125) is out of the oven. This platform will need to be at ambient temperature so that component placement is simple and smooth preventing ball disruption. Place a thermocouple at an appropriate location near the component in order to properly monitor ball temperatures. At the Re-balling Machine turn on the machine vacuum. Align the ball stencil. If there is slight misalignment between the flux / solder paste stencil and the ball stencil, typically it is more important that the ball stencil be precisely aligned than the flux stencil. Flux deposition does not require the precision of the ball on the component pad. The stencils are basically held in place and alignment is done by moving the component within its nest. In the instance that flux deposition requires absolute precision utilize specified stencil adapters (in-house machined) to ensure fixture height, depth and width exactly conform to reballed part dimensions. The ball stencil may be a combination of two or three stencils stacked on top of each other. Look through a microscope and ensure the stencils are properly aligned. There are locating pins that are placed to do this but the stencils may slip off the edge of the pins. Place Flux screen over component. Verify screen alignment under a microscope. Screens are not held fully rigid at their base. Brush flux onto the component pads through the screen. It is important to get flux on every single pad. When flux is not applied the pad will not hold the solder ball when the balls are dropped into place. Additionally, a dry pad, even if it holds a ball in place, will not properly wet to the solder ball during reflow. On the other hand avoid applying too much flux as excess flux on the component will potentially gum up the solder ball screen preventing proper ball drop onto the component. Once flux is brushed over the screen holes use a stainless steel squeegee to press the flux into the apertures. Lift the screen. Inspect under a microscope. If any pad is missing flux, apply a small amount with a knife blade tip. Apply solder balls over the hole locations. The more balls that are accurately placed initially the quicker the process and the fewer balls will roll free on the screen. An excess amount of free balls placed on the screen may make lifting the screen clear and removing excess balls difficult. Excess balls may spill onto component. Once the balls are on the screen, the ones that are not in holes may be placed with a shortened acid brush (cut down to about .25" length.) Lift the screen once all balls are in place. Excess balls may be collected by lifting the screen and tapping the balls into an ESD protective container. Balls that stick with the screen must be replaced on the component surface. Make extra balls available on a convenient surface. These balls may be placed on the component pads by touching a minute amount of flux paste flux to the tip of a knife blade, lifting a replacement ball (using the surface tension of the flux) and laying it in place on the component pad. Once all balls are in place the component may be gently propped up with a knife blade then the spatula placed under the component to lift. Gently slide the spatula under the component and keep the component angle as low as possible while lifting. Once lifted, place the component on the FR4 baking platform. Turn the oven off momentarily (Preventing the distraction caused by the heat and air flow of the convection oven.) Open the oven door and gently place the Baking platform in the oven. Close the oven door. Inspect the component balls with a microscope through the glass oven door. If any balls have been dislodged they will have to be put back in place. The balls do not have to be perfectly centered on the pads as surface tension will center them during reflow. The re-starting temperature of the oven can vary widely due to different times taken to place components. Testing on component temperatures indicates that the most aggressive placement of the components (placing in the oven when the oven temperature is 240 F (115 C) results in a slightly greater than 1 C per second rise in temperature for the first minute. After the first minute the ramp rate slows considerably. The BGA component may also be reflowed using an appropriate reflow cycle at a BGA rework machine or run through a bench top reflow oven. Once the component temperature reaches about 5 degrees short of 361 F (183 C) observe the balls closely. When reflow begins clock 30 seconds. After 30 seconds turn off the oven to begin temperature down ramp. Very gently open oven door by two or three inches to facilitate an appropriate cool down ramp. Place the small deionizing fan on high about two inches from the opening to promote even cool down of the oven chamber. The cool down temperature ramp of the air will occur relatively rapidly (still less than 2 C per second in the first minute.) At 130 C the components may be taken from the oven to ambient air to cool. Using gloves remove the package from the oven at about 266 degree F (130 degree C.) Allow components to cool in ambient temperature for three minutes to ensure package thermal stability prior to component movement. The component balls should be perfectly aligned and lustrous in appearance. If this is not the case, stop the project and consult with project engineer. Inspect the body of the component for deformation. Also inspect for dings and nicks in the substrate, potting compound or die cover. Notify engineering of any defects. 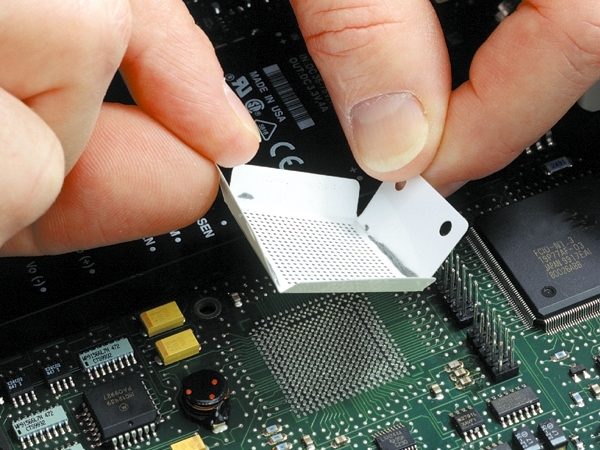 Inspect the underside of the BGA for cleanliness, flux residue and debris left over from reballing process. If the BGAs are not perfectly clean, inform engineering for process corrections.